Wear Red and Walk for Daniel! The 12th annual 'Walk for Daniel' will take place on Friday 28th October from 6am. The walk is approximately 4km long, starting at Suncoast Christian College in Woombye and finishing at Briggs Park in Palmwoods. 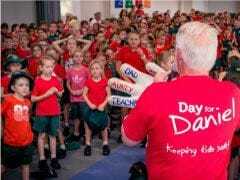 'Walk for Daniel' is the Daniel Morcombe Foundation's opening event of our National Day of Action - 'Day for Daniel'. The Daniel Morcombe Foundation held the first Walk for Daniel in November 2005. The walk follows the same path that Daniel walked from Palmwoods to arrive at the Nambour Connection Road in Woombye, where he waited for the bus to the Sunshine Plaza before being abducted and murdered. The walk is approximately 4km long, starting at Suncoast Christian College in Woombye and finishing at Briggs Park in Palmwoods. The aim of this walk is to raise awareness of child safety and protection. The Walk will commence at Suncoast Christian College, Cnr Schubert & Kiel Mountain Road Woombye and conclude at Briggs Park on Jubilee Drive, Palmwoods. The walk is approximately 4kms in length on footpaths which are suitable for prams, strollers and wheelchairs. Water is provided at the start of the event. A Sausage Sizzle an coffee is available at the start and finish of the event. 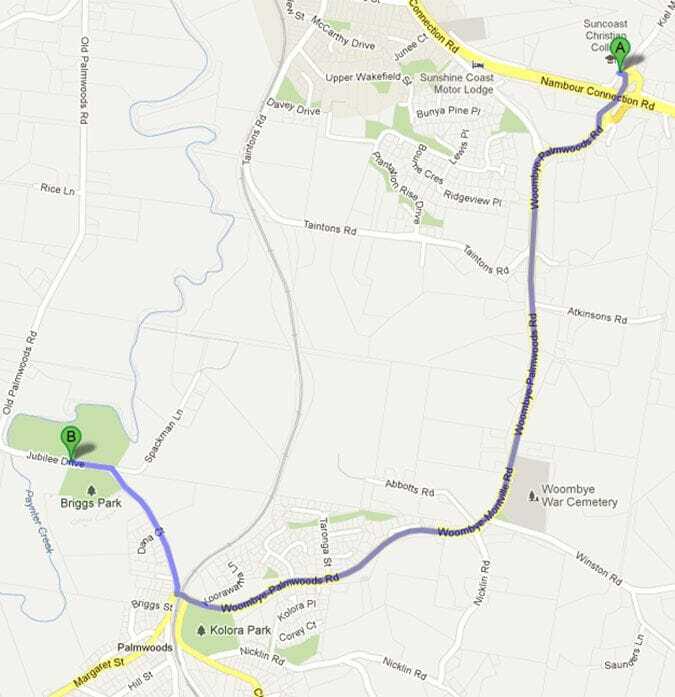 We encourage all Walk for Daniel participants to park and ride from G Rae Oval (B) to Suncoast Christian College (A). ie the finish point and catch a bus to the start of the Walk at Suncoast Christian College in Woombye. Your car will be right there when you finish your walk. 12 shuttle buses are available to get you to the starting point quickly and easily. Please read below for directions to G Rae Oval. G Rae Oval will be on your left. Limited parking is available at the start point at Suncoast Christian College, if this is your preference. Please advise the SES Traffic Controller that you would like to park at the College. You can then catch one of the buses returning from G Rae Oval to the Suncoast Christian College at the conclusion of the event.